Party officials say several elected officials at the luncheon will attest to the inspiration they continue to draw from Shriver, a native of Westminister, Md. 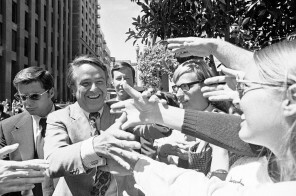 who married into the Kennedy family and replaced Thomas Eagleton as the Democratic vice presidential nominee in 1972. Shriver died last year after a long battle with Alzheimer’s disease. Others scheduled to speak at Tuesday’s luncheon include Comptroller Peter Franchot (D), Rep. Elijah Cummings (D-Md. ), Rep. Chris Van Hollen (D-Md. ), 6th District congressional nominee John Delaney and Maryland Democratic Party Chairwoman Yvette Lewis. Click here to read the article at washingtonpost.com.